Teaching kids about money and key economic concepts can set the stage for a more financially secure adulthood. But new research suggests many children aren’t getting a proper financial education from their parents. Findings from the Junior Achievement-Jackson Children’s Financial Literacy Survey revealed that 33% of youngsters haven’t been taught how to get or earn money. The poll of 500 elementary school-aged children and their parents also revealed that 41% of children had not been taught how to spend money. Additionally, nearly half (47%) had not learned how to give money to help people. While a kindergartner might not need more than a general knowledge of financial concepts, experts say parents should start getting more specific with kids when they are around 8 to 10 years old. By the time your child is a teenager, they should have a clear understanding of key money concepts, such as what it takes to pay for your family’s style of living and how much you sock away in savings, according to the authors of Guerilla Parenting: How to Raise an Entrepreneur. 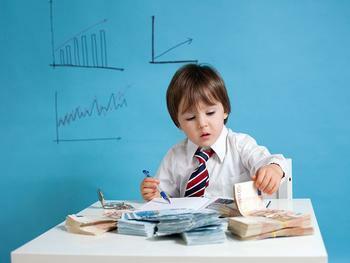 “The main reason that you need to educate your kids on money is that, if you do not, they will always be asking you for it,” Jerry Lynch, a financial adviser and owner of JFL Consulting quipped in an interview with CNBC.com. Wants Vs. Needs. A want may sometimes feel like a need in the mind of a child, but it’s important to help children distinguish between the two. Help your child learn that wants are things you desire and needs are necessities you can’t live without. The cost of food. Teach your child how much food costs in your home. You can even take it a step further by teaching them how to stretch a dollar at the grocery store by using coupons and a calculator. How credit cards work. Help teenagers understand that credit cards aren’t a source of free money. To help your child learn to use credit wisely, the financial experts at American Consumer Credit Counseling (ACCC) recommend allowing them to borrow money from you. If they miss a payment, don’t hesitate to charge a small late fee. How much you save and why. It’s important for kids to see their parents thinking about money, planning for the financial future, and doing their best to handle their money well. Teach them how to save smartly and arm them with an understanding of why it’s important to have savings. How much the family spends on various things. Help your child understand how much money your family spends on vacations and entertainment, clothes and gear, music and extracurricular activities. Clue them in on why the family will be vacationing in the U.S. instead of jetting off to France. The simplest way to make a positive impact on your child's financial future is to have more conversations about money, according to Jackson Charitable Foundation Executive Director Danielle Robinson. "As adults, it's our responsibility to help children feel less confused and more motivated about money,” said Jack E. Kosakowski, president and chief executive officer of Junior Achievement USA. “Simply helping your child open and manage a bank account to save for something specific such as pocket money for an upcoming vacation or even college is a great way to help kids learn to achieve financial freedom and excite kids about money, especially when they see it accumulate."